This expedition takes us through some of the remote regions in the Northeast of Vietnam. Colorful markets, cultural diversity and the unique sceneries make this unforgettable adventure. On arrival at Noi Bai International airport, you will be met and transferred to Hanoi Railway station to catch the night train to Lao Cai. Day2: Lao Cai – Sapa – Y Linh Ho – Cat Cat villages – Sapa. Arriving in Lao Cai in the early morning, you are welcomed by your guide and driver for transferring to Sapa town, having breakfast before trekking about 4 hours along mountain trails or main road on your request to visit Y Linh Ho and Cat Cat villages which is inhabited by Black Hmong people. Along the way, you have chance to see a lots of beautiful landscapes such as rice terraced, Fairy Waterfall, Golden stream. Coming to visit and talk to the native people, studying their own culture and custom. Having picnic lunch next to river before having a short walk the centre of Cat Cat village where you have chance to understand more about the mountain tribe people by watching local performance. Coming back to Sapa in the late afternoon to check in the hotel and then you are free to discover the Sapa town or Market. Day3: Sapa – Suoi Ho – Matra villages – Cao son – Coc Ly – Bac Ha town. After breakfast at the hotel, we walk cross through Suoi Ho village to walk about 2 hours to visit Matra village which are the home to Red Dzao and Hmong people. Difference from other Hmong villages, the Matra village is not ruined by tourist, everything seems to be preserve here. Meeting driver at the end of the village and we are transferred to Cao Son through Chinese border town of Lao cai. Having lunch in Lao cai and then we follow the mountainous road to enjoy the amazing scenery along the way as well as other mountain tribes such as: Nung, Ha Nhi, Blue Hmong. When we arrive in Coc ly, we can travel by boat along the Chay River to Trung Do village where we start to trek about 3 km along the village of Tay people. Our driver is waiting for us at the end of village and transfers us to Bac Ha town. Day4: Bac Ha – Market (Sunday) – Ban Pho village – Hagiang. If we are here on Sunday morning, we have chance to see Bac ha market which attract a wide variety of ethnic minority groups included Flower Hmong, Phu La, La Chi, Tay who sill retain their age old cultural traditions and are recognizably distinct from each other by their dress. 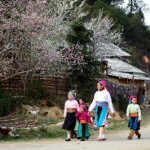 And then we can walk to Ban Pho village to see the Flower Hmong tribe. We return to Bac Ha town at noon to have lunch before being transferred to Ha Giang city which is about 140km from Bac Ha. We sleep at resort in Ha Giang. Day5: Ha Giang – Dong Van Highland. Depart in the early in the morning to visit the wonderful world of ethnic minority people. We will go on the mountain with many impressive sceneries and visit may basically ethnic villages and colorful weekend markets such as Quyet Tien Market. Lunch at the local restaurant in Quang Ba town, we keep driving about 2 hours more to arrive at Dong Van highland which locate at altitude of over 1000 meter above sea level, fresh air, wild scenery, majestic nature with endlessly range of limestone mountain. Landscape here is very similar to the landscape on the moon. Checking the hotel and relaxing for an hour before climbing uphill to visit Ta Chai village which belong to Lo Lo people and the villager here is separated from town life, you will be very surprised at how the local people can survive at this hard life here and unchanged for centuries. We are transferred back to the hotel by car. We sleep at hotel in Dong Van highland. Day6: Dong Van – Meo Vac – Ba Be National Park. Breakfast at the hotel and then we are transferred to Meo Vac. Today, it will be a the best chance to witness the most amazing view at Ma Phi Leng pass and walking to some untouched villages along the way to see Pu Peo, Lo Lo or White Hmong tribes. Lunch will be served at the local restaurant in Bao Lac town and then we take a small trail going through jungle, we ride across many streams and river. Continuing to Ba Be Lake where the landscape is amazing and the home stay is another unique experience. We have dinner and overnight at the local house of Tay people. Day7: Trekking and traveling by boat into the three lakes of Babe. Taking a three hour boat cruise on Ba Be Lake and short walk to visit a Tay minority village where we can enjoy the lunch with local people here. The lake is surrounded by rugged limestone mountains, lush forests. After lunch we have short walk along the National Park to visit Puong Grotto and Dau Dang Waterfall. In the afternoon, we keep walking and observing the daily life of the locals through their activities such as fishing on the lake or going to work on the farm. Back to Bac Ngoi village for another night at the local house or hotel on your request. Day8. Be Ba National Park – Ha noi. After breakfast, we say goodbye to the friendly villager and go to Hanoi which is about 220 km from Ba Be and it takes us about 6 hours. We finish our tour in Hanoi.